Hartley's Gripe Water is a leading colic and wind medicine for infants. Word of mouth from mother to daughter has made Hartley's Gripe water an essential remedy for infants and is available from leading pharmacies throughout Australia & New Zealand. Hartley's Gripe Water is a natural blend of herbal ingredients of Dill Seed Oil, Meadowsweet, Coriander Oil & Peppermint Oil. These herbs have been used safely in commercial infant preparations for more than 100 years. Dill Seed Oil is used as a digestive aid which relaxes the muscles of the digestive tract and studies show that it helps prevent the formation of intestinal gas. Meadowsweet neutralises excess stomach acid and has antacid action. Coriander Oil is used as a calmative to relieve flatulence, stomach ache and nausea. It reduces muscle tension and spasm. Peppermint Oil reduces muscle tension and spasm: relieves wind and colic, suppresses nausea and vomiting. It is used to calm digestive problems, irritable bowel syndrome, colic & flatulence. 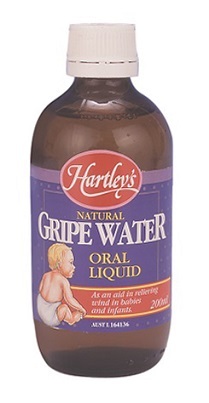 Hartley's Gripe Water helps reduce infant colic, wind and minor tummy upsets. Store below 30°C. Does not contain artificial sweeteners. Contains the preservative methyl hydroxybenzoate.